Background: Certolizumab pegol is a PEGylated tumour necrosis factor inhibitor. Objective: To evaluate the efficacy and safety of certolizumab pegol versus placebo, plus methotrexate (MTX), in patients with active rheumatoid arthritis (RA). Methods: An international, multicentre, phase 3, randomised, double-blind, placebo-controlled study in active adult-onset RA. Patients (n = 619) were randomised 2:2:1 to subcutaneous certolizumab pegol (liquid formulation) 400 mg at weeks 0, 2 and 4 followed by 200 mg or 400 mg plus MTX, or placebo plus MTX, every 2 weeks for 24 weeks. The primary end point was ACR20 response at week 24. Secondary end points included ACR50 and ACR70 responses, change from baseline in modified Total Sharp Score, ACR core set variables and physical function. Results: Significantly more patients in the certolizumab pegol 200 mg and 400 mg groups achieved an ACR20 response versus placebo (p⩽0.001); rates were 57.3%, 57.6% and 8.7%, respectively. Certolizumab pegol 200 and 400 mg also significantly inhibited radiographic progression; mean changes from baseline in mTSS at week 24 were 0.2 and −0.4, respectively, versus 1.2 for placebo (rank analysis p⩽0.01). Certolizumab pegol-treated patients reported rapid and significant improvements in physical function versus placebo; mean changes from baseline in HAQ-DI at week 24 were −0.50 and −0.50, respectively, versus −0.14 for placebo (p⩽0.001). Most adverse events were mild or moderate, with low incidence of withdrawals due to adverse events. Five patients developed tuberculosis. Conclusion: Certolizumab pegol plus MTX was more efficacious than placebo plus MTX, rapidly and significantly improving signs and symptoms of RA and physical function and inhibiting radiographic progression. Certolizumab pegol is a PEGylated Fab′ fragment of a humanised anti-TNF antibody with high affinity to TNF. It lacks an Fc region and may thus avoid potential Fc-mediated effects such as complement- or antibody-dependent, cell-mediated cytotoxicity, which have been seen in vitro, and attachment of the PEG moiety to the Fab′ fragment yields a molecule with a plasma half-life of about 2 weeks.14 Certolizumab pegol is effective in the treatment of Crohn’s disease,15 16 and has been shown to significantly improve the signs and symptoms of active RA in phase 217 and phase 318 trials. This study, Rheumatoid Arthritis PreventIon of structural Damage 2 (RAPID 2), evaluated the efficacy and safety of subcutaneous liquid certolizumab pegol (200 mg and 400 mg) plus MTX every 2 weeks compared with placebo plus MTX in patients with active RA despite ⩾6 months’ MTX treatment. RAPID 2 was a 24-week, phase 3, double-blind, randomised, multicentre, placebo-controlled study at 76 international sites (June 2005 to September 2006). Patients were randomised 2:2:1 to one of two regimens of subcutaneous liquid certolizumab pegol (400 mg at weeks 0, 2 and 4, followed by 200 or 400 mg every 2 weeks) plus MTX, or placebo (saline) plus MTX. The study was conducted in accordance with good clinical practice and the Declaration of Helsinki and was approved by an institutional review committee at each participating centre. All participating patients provided written informed consent. Patients who did not show an ACR20 response at both weeks 12 and 14 were to be withdrawn from the study, designated ACR20 non-responders in the primary analysis and allowed to enter an open-label extension study at week 16 with certolizumab pegol 400 mg every 2 weeks. The full inclusion and exclusion criteria are available online as supplementary material. Eligible patients were aged ⩾18 years with a diagnosis of RA, defined by American College of Rheumatology (ACR) 1987 criteria,19 of ⩾6 months’ duration but not longer than 15 years, with active disease at screening and baseline. Patients had to have received prior MTX for ⩾6 months (stable dose ⩾10 mg/week for ⩾2 months before baseline). Patients were excluded if they had received any biological agent for RA within 6 months before enrolment (3 months for etanercept and anakinra), had received previous treatment with a biological agent resulting in a severe hypersensitivity or anaphylactic reaction, or had not initially responded to previous anti-TNF therapy. Oral corticosteroids (⩽10 mg/day prednisone equivalent) and non-steroidal anti-inflammatory drugs and cyclo-oxygenase-2 inhibitors were permitted provided that the doses were stable within 28 and 14 days of baseline, respectively and remained stable during the study. Patients with history of, or positive chest x-ray findings for, tuberculosis, or a positive purified protein derivative (PPD) skin test (defined as positive indurations per local medical practice) were excluded. As per protocol, if a positive PPD skin test was assumed by the local investigators to be related to previous bacille Calmette–Guérin (BCG) vaccination and was not associated with clinical or radiographic suspicion of tuberculosis, patients could be enrolled at the discretion of the investigator. In total, 101 patients (16%) were enrolled with a PPD test ⩾5 mm at baseline. Assessments were made at baseline, weeks 1, 2, 4, 6, 8, 12, 14, 20 and 24, or withdrawal. The primary end point was ACR20 response at week 24, defined as a decrease of ⩾20% from baseline in the number of tender (n = 68) and swollen (n = 66) joints, plus a 20% improvement in three or more of the following: patient’s and physician’s global assessment of disease activity, patient’s assessment of arthritic pain, Health Assessment Questionnaire-Disability Index (HAQ-DI) and serum C-reactive protein or erythrocyte sedimentation rate (ESR).20 Secondary efficacy end points at week 24 included ACR50, ACR70, mean change from baseline in van der Heijde-modified Total Sharp Scores (mTSS),21 22 Short Form-36 (SF-36) Health Survey,23 and individual ACR core set variables. Disease activity was assessed using the Disease Activity Score 28-joint assessment 4 (DAS28 (ESR)4). Radiographic assessments of hands and feet were performed at baseline and at week 24 or withdrawal using the van der Heijde mTSS, which quantifies erosions (erosion score (ES)) and joint space narrowing (JSN).21 22 Radiographs were read centrally and blinded (for treatment, visit and patient identification) and independently by two experienced readers. The mean score of two readers was used for analyses. Safety was assessed at all visits, from screening through follow-up visits 12 weeks after the last dose for patients who did not enter the open-label extension phase. Sample size was determined on expected differences in the ACR20 responder rate between certolizumab pegol and placebo at week 24. Five hundred and ninety randomised patients would provide 90% power to detect a difference of ⩾20% in ACR20 response at week 24 between each certolizumab pegol group and placebo at a two-sided significance level of α = 0.025, assuming a placebo rate of 30%. Efficacy analyses were conducted on the intention-to-treat (ITT) population (all randomised patients). Primary analysis used non-responder imputation; patients who received rescue drugs (any non-biological disease modifying antirheumatic drug other than MTX, any other biological agent, intravenous corticosteroids, or intra-articular hyaluronic acid) or withdrew for any reason were considered non-responders from that time point onward. The number of subjects in the summaries varies slightly from the ITT numbers owing to non-imputable missing data. Treatment comparisons for the certolizumab pegol groups with placebo were performed using logistic regression with factors for treatment and region. Treatment effects were estimated with odds ratios and 97.5% confidence intervals (CIs) obtained by fitting this model. p Values of these treatment effects were also calculated (Wald test). To control the type I error rate further at 5%, a closed test procedure27 was used. Safety analyses were conducted on the safety population (all patients who received treatment). Treatment comparisons for change from baseline at week 24 in individual ACR core set components were analysed using analysis of covariance with last observation carried forward (LOCF) imputation, with region and treatment group as factors and baseline value as covariate. Mean change from baseline mTSS was analysed using analysis of covariance on the ranks, with treatment and region as factors and rank baseline mTSS as covariate. mTSS at week 24 for early withdrawals was estimated by linear extrapolation of the last available value to week 24, assuming disease progression occurred at the same rate between weeks 0 and withdrawal. Sensitivity analyses were performed under various assumptions on the imputation of missing values, including LOCF imputation of missing scores. Six hundred and nineteen patients were randomised (ITT population); 246 each to certolizumab pegol 200 mg and 400 mg and 127 to placebo. Only 17 (13.4%) placebo patients completed the study versus 174 (70.7%) and 181 (73.6%) in the certolizumab pegol 200 mg and 400 mg groups, respectively. More placebo-treated patients (79.5%; n = 101) discontinued treatment owing to lack of ACR20 response at week 16 versus certolizumab pegol 200 mg (19.9%; n = 49) and 400 mg (18.7%; n = 46) (fig 1). Of these, all except one patient from the placebo group entered the open-label extension study. Patient disposition. *Two patients in the placebo treatment group received CZP and are included in the 200 mg group for safety evaluations. CZP, certolizumab pegol; ITT, intention-to-treat; MTX, methotrexate. Patient demographics and baseline characteristics were similar in the three treatment groups and indicated high baseline disease activity (table 1). Baseline demographics were also similar among patients who withdrew at week 16. Differences in ACR20 responses at week 24 were significant for certolizumab pegol 200 mg and 400 mg plus MTX, respectively, versus placebo plus MTX (fig 2A; p⩽0.001; response rates: 57.3%, 57.6% and 8.7%, respectively), as were differences in ACR50 and ACR70 responses (fig 2A; p⩽0.01). ACR responder rates at week 24 (ITT population—non-responder imputation) and change from baseline in disease signs and symptoms over time (ITT population). (A) *p<0.001 versus placebo; †p⩽0.01 versus placebo relate to comparison of odds ratios (ORs) from logistic regression with treatment and region as factors; ‡OR = 14.4 (97.5% CI 6.7 to 31.0); §OR = 14.8 (95% CI 5.3 to 41.6); ¶OR = 23.8 (95% CI 3.2 to 175.9); **OR = 14.3 (97.5% CI 6.7 to 30.8); ††OR = 15.3 (95% CI 5.5 to 42.9); ‡‡OR = 15.5 (95% CI 2.1 to 115.4). (B) *p<0.001 versus placebo; †p⩽0.01 versus placebo; ‡p⩽0.05 versus placebo. (C–E) *p<0.001 versus placebo using ANCOVA with treatment and region as factors and baseline as covariate. LOCF. ACR, American College of Rheumatology; CI, confidence interval; CZP, certolizumab pegol; DAS28 (ESR), Disease Activity Score 28 (erythrocyte sedimentation rate); HAQ-DI, Health Assessment Questionnaire-Disability Index; ITT, intention-to-treat; LOCF, last observation carried forward; LS, least squares; MTX, methotrexate. Certolizumab pegol conferred rapid improvement in the signs and symptoms of RA. Significantly higher ACR20 responses were seen with certolizumab pegol as early as week 1, increased over the first 12 weeks and were maintained through week 24 (fig 2B; p⩽0.01). ACR50 and ACR70 responses were significantly higher by weeks 6 and 20, respectively (fig 2B; p⩽0.01). Certolizumab pegol conferred improvements in all ACR core components versus placebo (table 2), including significant reductions in swollen (fig 2C) and tender joint counts (data not shown) by week 1, with continued improvement to week 24. A significant proportion of the total effect of certolizumab pegol was seen by week 4 (table 2). Treatment with certolizumab pegol plus MTX was also associated with significantly greater improvement in DAS28 (ESR) from baseline versus placebo at all time points (p<0.001; fig 2D). At week 24, mean (SD) change was: 200 mg, –2.27 (1.38); 400 mg, –2.46 (1.31); placebo, −0.50 (1.05). DAS28 remission (DAS28 <2.6) was seen in 9.4% or 8.5% of patients treated with certolizumab pegol 200 mg or 400 mg, respectively, at week 24, compared with 0.8% of patients treated in the placebo group (p⩽0.05 vs placebo). 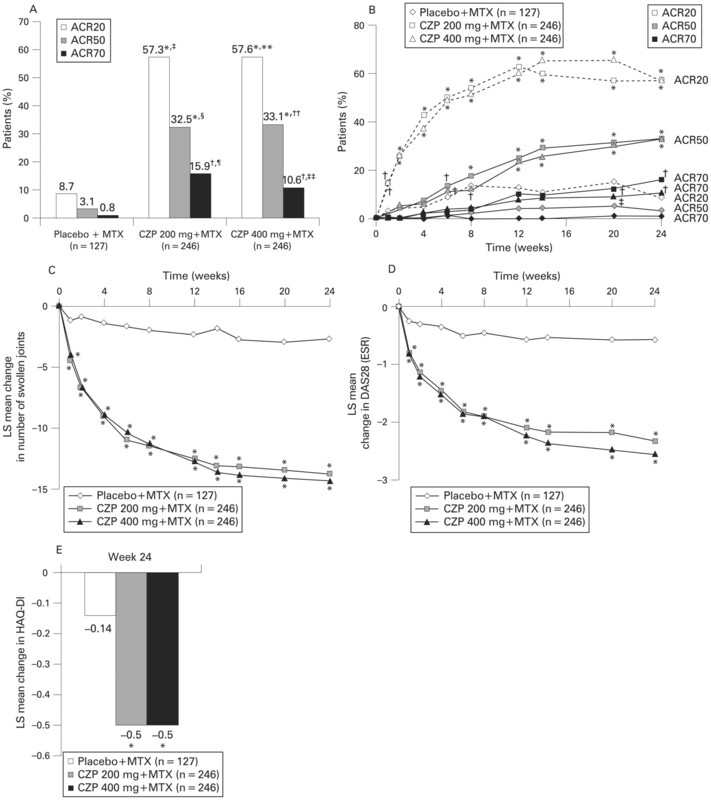 Significantly more certolizumab pegol-treated patients reported significant improvements in physical function (HAQ-DI) versus placebo from week 1 to week 24 (p<0.001; fig 2E) and clinically meaningful improvements in physical function (HAQ-DI MCID) from weeks 2 to 24. By week 24, 57% and 53% of patients in the certolizumab pegol 200 mg and 400 mg groups, respectively, achieved HAQ-DI MCID versus 11% of placebo patients (p<0.001). Patients receiving certolizumab pegol also reported significantly greater improvements in SF-36 PCS, MCS and PF domain scores versus placebo at weeks 12 and 24 (p<0.001). At week 24, adjusted mean changes from baseline in PCS were 5.2 and 5.5 for certolizumab pegol 200 and 400 mg, respectively, versus 0.9 for placebo and in PF domain scores were 12.1 and 12.4, respectively, versus 0.6 for placebo (p<0.001). Sensitivity analyses of clinical and radiographic efficacy, physical function and health-related quality of life, including LOCF, confirmed the main analyses (data not shown). Mean changes from baseline to week 24 in mTSS were significantly less in patients treated with certolizumab pegol 200 mg (0.2; 95% CI −0.1 to 0.6) and 400 mg (−0.4; 95% CI −0.7 to −0.1) plus MTX versus placebo plus MTX (1.2; 95% CI 0.5 to 2.0) (fig 3A, left graph; p⩽0.01 (200 mg) and p⩽0.001 (400 mg) by rank analysis). The negative CI for the certolizumab pegol 400 mg group suggests that some repair may have occurred.28 Mean changes from baseline in ES were 0.1 (95% CI −0.1 to 0.4) and −0.3 (95% CI −0.6 to −0.1) with certolizumab pegol 200 mg and 400 mg, respectively, versus placebo (0.7; 95% CI 0.3 to 1.2) (p⩽0.01 (200 mg), p<0.001 (400 mg) by rank analysis) (fig 3B). Mean changes from baseline in JSN for certolizumab pegol 200 mg and 400 mg were 0.1 (95% CI −0.1 to 0.3) and −0.1 (95% CI −0.2 to 0.0), respectively, versus 0.5 (95% CI 0.1 to 0.9) for placebo (p⩽0.01 by rank analysis; fig 3B). The cumulative probability plots at week 24 show that more patients in the placebo plus MTX group show progression, and to a greater extent, than patients treated with certolizumab pegol plus MTX (supplementary fig 1, online only). Change from baseline in mTSS, ES and JSN at week 24 (ITT population—linear extrapolation). (A) *p<0.001; †p⩽0.01; ‡p⩽0.05 versus placebo (ANCOVA on ranks with treatment and region as factors and rank baseline as covariate). Lehmann point estimate of shift (95% CI): §−0.3 (−0.8 to 0.0); ¶−0.7 (−1.0 to 0.0). (B) *p<0.001; †p⩽0.01 versus placebo (ANCOVA on ranks with treatment and region as factors and rank baseline as covariate). Lehmann point estimate of shift (95% CI): ‡0.0 (−0.5 to 0.0); §−0.5 (−0.7 to 0.0); ¶0.0 (0.0 to 0.0); **0.0 (0.0 to 0.0). ANCOVA, analysis of covariance; CI, confidence interval; CZP, certolizumab pegol; ES, erosion score; ITT, intention-to-treat; JSN, joint space narrowing; mTSS, modified Total Sharp Scores; MTX, methotrexate. In addition, for patients who withdrew at week 16, there was significantly less radiographic progression in certolizumab pegol-treated patients (combined data) than with placebo (fig 3A, right graph). Post hoc linear extrapolation of the week 16 radiographic data suggests that a significant treatment difference would also have been seen at week 24. Owing to the higher rate of ACR20 non-responders at week 16 in the placebo group, mean treatment exposure was longer in the certolizumab pegol groups than the placebo group. Adverse events occurred in 52.8%, 56.0% and 50.8% of patients in the placebo, certolizumab pegol 200 mg and 400 mg groups, respectively; most were mild/moderate in intensity (table 3). The most frequently reported adverse events included urinary tract infection, haematuria and bacteriuria for placebo; urinary tract infection, upper respiratory tract infection and headache for certolizumab pegol 200 mg; and hypertension and headache for certolizumab pegol 400 mg (table 3). Adverse event reporting of hypertension was at the discretion of the investigator and no preset guidelines were defined. Post hoc analysis showed that hypertensive events were related to previous hypertensive status, were transitory and were not related to the study injection. One case (0.4%) of lupus erythematosus rash with certolizumab pegol 200 mg occurred. No injection-site reactions or pain (Medical Dictionary for Regulatory Activities (MedDRA) coded) were reported for placebo. There were 3 (1.2%) or 5 (2.0%) cases of injection-site reactions and 0 or 1 (0.4%) case of injection-site pain in the certolizumab pegol 200 mg or 400 mg groups, respectively. Adverse events leading to discontinuation of the study drug were 1.6% for placebo and 4.8% and 2.8% for certolizumab pegol 200 mg and 400 mg, respectively. Anti-certolizumab pegol antibodies were detected in 5.1% of patients receiving certolizumab pegol plus MTX. The number of antibody-positive patients was too low to identify any statistically or clinically significant antibody effect on response. Nine patients had neutralising antibodies: 5 (2.0%) in the certolizumab pegol 200 mg group and 4 (1.6%) in the 400 mg group. The incidence of serious adverse events was 3.2% for placebo and 7.3% in each certolizumab pegol group. Serious infections occurred in 0%, 3.2% and 2.4% in the placebo, certolizumab pegol 200 mg and 400 mg groups, respectively. Serious infections included one case each of erysipelas, disseminated tuberculosis, peritoneal tuberculosis, pulmonary tuberculosis, gastroenteritis, postoperative wound infection, tooth abscess and urosepsis with certolizumab pegol 200 mg and one case each of erysipelas, pneumonia and upper respiratory tract infection and two cases each of sinusitis and tuberculosis with 400 mg. Five patients in the certolizumab pegol arms developed tuberculosis: three from Russia, one from Poland and one from Latvia. At screening, two of these five patients had PPD reactions of 4–5 mm with normal chest x-ray findings and one patient with a PPD reaction (6 mm) also had abnormal chest x-ray findings at baseline, which were deemed not clinically significant by local investigators. These patients were enrolled into the study by investigator discretion. The length of time from exposure to certolizumab pegol to development of tuberculosis ranged from 58 to 169 days. All patients received treatment for tuberculosis and the study drug was permanently discontinued in four of the five cases. In one case, the patient completed the study. One case of malignant neoplasm was reported in each of the placebo (bladder cancer), certolizumab pegol 200 mg (testicular cancer) and certolizumab pegol 400 mg (colon cancer) groups. Two patients died during the study, one in the certolizumab pegol 200 mg (myocardial infarction) and one in the 400 mg (fracture, shock) groups; these events were assessed as unlikely to be related to the study drug. A prolonged activated partial thromboplastin time (aPTT) was seen in the 200 mg and 400 mg dose groups of certolizumab pegol (4.8% and 4.9% of patients, respectively) versus placebo (1.6%). Additional analyses demonstrated that PEG interferes with the phospholipid component of some commercial assays that measure aPTT, including the HemosIL aPTT-SP-liquid (Instrumentation Laboratory, Lexington, Massachusetts, USA) and PTT-LA (Diagnostica Stago, Parsippany, New Jersey, USA) assays used in this trial. This trial demonstrated that certolizumab pegol plus MTX significantly improved the signs and symptoms of RA, inhibited progression of joint damage and increased physical function and quality of life versus placebo plus MTX in patients with active RA despite MTX. Statistically significant and clinically meaningful differences between placebo and both certolizumab pegol doses were observed with respect to the primary end point (ACR20 response) and all secondary end points (including ACR50, ACR70, ACR core set variables such as swollen and tender joint counts, changes in DAS28 and DAS28 remission). These clinical benefits were achieved rapidly, as early as 1 week of treatment, in this population of patients with severe disease (91% with DAS28 >5.1 at baseline). 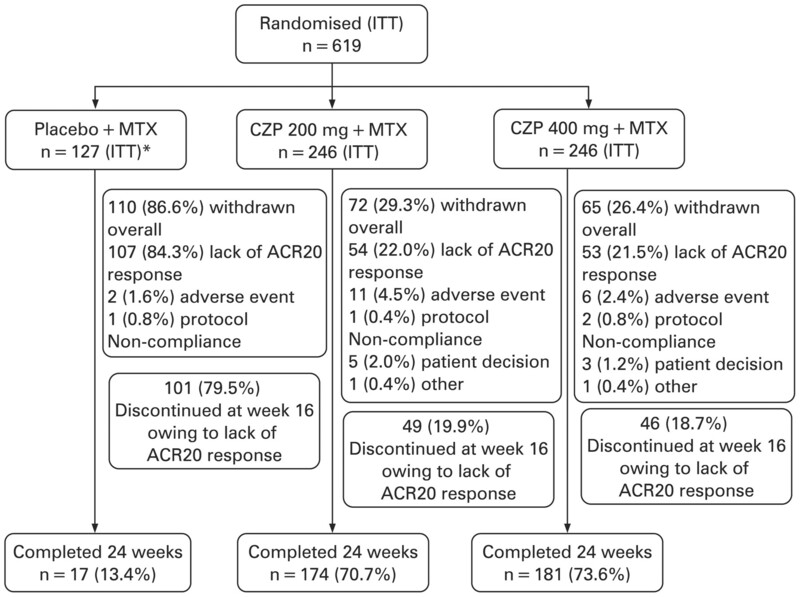 Although the weekly dosage of MTX used in this trial was low by US standards, post hoc analyses showed that ACR20/50/70 response rates at week 24 were similar in patients who received baseline MTX doses of 10 mg/week, >10–15 mg/week and >15 mg/week. There were no statistically significant differences in clinical efficacy on any study primary or secondary end points between the two certolizumab pegol dose groups, suggesting that a 200 mg dose every 2 weeks is optimal for treatment. 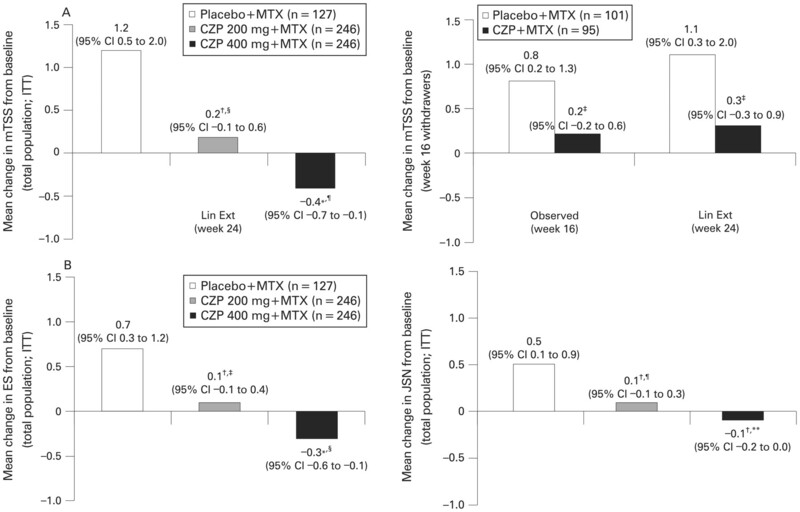 Both doses of certolizumab pegol plus MTX significantly inhibited the progression of structural joint damage compared with placebo plus MTX, as demonstrated by significantly lower mean changes from baseline in mTSS, ES and JSN scores. Comparable inhibition of progression was seen with both certolizumab pegol doses and there was some suggestion of repair of joint damage in the 400 mg dose group (negative 95% CI of the change in mTSS).28 An additional analysis of the radiographic data from patients who withdrew at week 16 owing to ACR20 non-response (per protocol) found that certolizumab pegol had slowed the progression of joint damage in these patients even though they had not achieved an ACR20 response, confirming that certolizumab pegol rapidly inhibits joint damage. These data are also in line with previous findings on a dissociation of inflammation and destruction in the course of anti-TNF plus MTX treatment.29 Certolizumab pegol provided rapid, significant and clinically meaningful improvements in physical function and quality of life, with significant changes in HAQ-DI at week 1 and in SF-36 PCS, MCS and PF domains at week 12, which continued to improve through to week 24. As functional outcomes are associated with structural damage in progressive RA,30–32 treatments that can both improve physical function and inhibit joint damage may help prevent long-term disability. The robustness of all clinical, radiographic and physical function findings were confirmed by sensitivity analyses (data not shown). Certolizumab pegol plus MTX had an acceptable safety profile with a low incidence of discontinuations due to adverse events. An isolated increase in aPTT was seen for patients treated with certolizumab pegol and placebo in this study. However, no association was seen between increased coagulation assay time and bleeding events. Additional laboratory analyses have shown that this observation was an in vitro phenomenon and that there is no effect on in vivo coagulation function (data not shown). Serious infections, including tuberculosis, were reported more frequently with certolizumab pegol than placebo, consistent with rates associated with other anti-TNF treatments.33 Tuberculosis was reported in a total of five patients (all treated with certolizumab pegol) and was partly attributable to insufficient stringency in screening results by local investigators combined with high background rates of tuberculosis.34 If current criteria were used to screen for tuberculosis, two of these patients would have been classified as having positive PPD reactions and would have been excluded from the study. The incidence of malignancy was low (one patient in each treatment group), with no reported lymphomas. The three licensed anti-TNF agents are either monoclonal antibodies (adalimumab, infliximab) or receptor constructs (etanercept) and all contain an immunoglobulin G Fc portion. Interestingly, the data shown here show that the Fc portion, which is lacking in certolizumab pegol, is not necessary for TNF inhibitors to be clinically effective in RA. Thus, the primary mode of action of TNF inhibitors in RA does not appear to involve Fc-mediated effects but rather the binding and inactivation of TNF and, probably, reverse signalling,35 36 which can also be mediated by an Fc-free Fab′ molecule such as certolizumab pegol. In summary, this study demonstrated that certolizumab pegol rapidly and significantly ameliorates clinical signs and symptoms of RA, inhibits progression of structural damage and improves physical function and quality of life in patients with active RA despite MTX. These clinical benefits are associated with a low rate of injection-site reactions and a safety profile consistent with other anti-TNF therapies. Therefore, certolizumab pegol expands the treatment armamentarium for patients with RA. We acknowledge the editorial services of Linda Wychowski and Joanne Vaughan from PAREXEL.
. Role of cytokines in rheumatoid arthritis. Ann Rev Immunol 1996;14:397–440.
. Monoclonal anti-TNF alpha antibody as a probe of pathogenesis and therapy of rheumatoid disease. Immunol Rev 1995;144:195–223.
. Rheumatoid arthritis therapy after tumor necrosis factor and interleukin-1 blockade. Arthritis Rheum 2003;48:3308–19.
. Updated consensus statement on biological agents, specifically tumour necrosis factor α (TNFα) blocking agents and interleukin-1 receptor antagonist (IL-1RA), for the treatment of rheumatic diseases, 2005. Ann Rheum Dis 2005;64(suppl 4):iv2–14.
. Infliximab and methotrexate in the treatment of rheumatoid arthritis. N Engl J Med 2000;343:1594–602.
. The relationship of serum infliximab concentrations to clinical improvement in rheumatoid arthritis: results from ATTRACT, a multicenter, randomized, double-blind, placebo-controlled trial. Arthritis Rheum 2002;46:1451–9.
. Use of targeted anticytokine treatments in heart failure. Circulation 2000;102:E65.
. Mechanism of action of certolizumab pegol (CDP970): in vitro comparison with other anti-tumor necrosis factor α agents. Inflamm Bowel Dis 2007;13:1323–32.
. Certolizumab pegol for the treatment of Crohn’s disease. N Engl J Med 2007;357:228–38.
. Maintenance therapy with certolizumab pegol for Crohn’s disease. N Engl J Med 2007;357:239–50.
. Efficacy of a novel PEGylated humanized anti-TNF fragment (CDP870) in patients with rheumatoid arthritis: a phase II double-blinded, randomized, dose-escalating trial. Rheumatology (Oxford) 2002;41:1133–7.
. Certolizumab pegol plus methotrexate is significantly more effective than placebo plus methotrexate in active rheumatoid arthritis. Arthritis Rheum 2008;58:3319–29.
. How to report radiographic data in randomized clinical trials in rheumatoid arthritis: guidelines from a roundtable discussion. Arthritis Rheum 2002;47:215–8.
. SF-36 Physical and Mental Health Summary Scales: manual for users version 1. 2nd ed. Lincoln, Rhode Island, USA: Quality Metric, 2001.
. Improved health-related quality of life with effective disease-modifying antirheumatic drugs: evidence from randomized controlled trials. Am J Manag Care 2007;13(suppl 9):S237–51.
. Statistical considerations for multiplicity in confirmatory protocols. Drug Inf J 1996;30:523–34.
. Expert agreement confirms that negative changes in hand and foot radiographs are a surrogate for repair in patients with rheumatoid arthritis. Arthritis Res Ther 2007;9:R62.
. Serious bacterial infections in patients with rheumatoid arthritis under anti-TNF-alpha therapy. Rheumatology (Oxford) 2003;42:617–21. World Heath Organization. WHO country data: estimated burden of TB. Available at http://www.hpa.org.uk/infections/topics_az/tb/epidemiology/who_table1.htm (accessed 18 November 2008).
. Drug insight: different mechanisms of action of tumor necrosis factor antagonists-passive-aggressive behavior? Nat Clin Pract Rheumatol 2007;3:227–33.
. Infliximab induces potent anti-inflammatory responses by outside-to-inside signals through transmembrane TNF-alpha. Gastroenterology 2005;128:376–92. Competing interests: Declared. JS, RBL, PM, RFvV, AK, MS, GRB, VS and DvdH serve as consultants to UCB, Inc. RBL, AK, MS and DvdH receive research funding from UCB, Inc and GRB and JV have received honorarium from UCB, Inc for speaking. DM and KL are employees of UCB, Inc. JB has nothing to disclose. Funding: The RAPID 2 study was fully funded by UCB, Inc.
JS had full access to all of the data in the study and takes responsibility for the integrity of the data and the accuracy of the data analysis. Ethics approval: Ethics committee approval obtained. © Smolen et al 2009 This is an open-access article distributed under the terms of the Creative Commons Attribution Non-commercial License, which permits unrestricted use, distribution, and reproduction in any medium, provided the original work is properly cited.